What is it about a cottage cheese that makes all go Mmmmm…….. 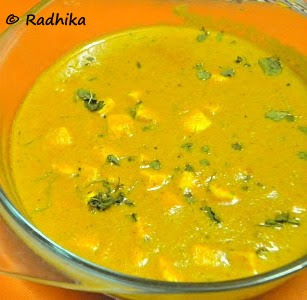 Whenever my In-laws visit us I make paneer dishes often as they love it very much. They don’t get paneer in their place and love trying it out in my place especially cooked by me. Arun and FIL are wonderful critics of my cooking. I love making new dishes specially for them. This is one such repeated requests by both of them. Cube the paneer and sauté in a tsp of butter for a minute and keep aside. Cube the onions and tomatoes. Slit the green chilli. Heat oil in a pan, add the cloves, cardamom, cinnamon and black pepper corns. Cook for a minute. Add the garlic, ginger and green chilli. Cook for a minute. Add the onion and cook till the onions turn a slight brown. Now add the tomatoes and cook till the tomatoes turn mushy. Add the cashew nuts, mix well and keep aside to cool. Grind this mixture to a smooth paste using as little water as possible. Heat butter in the same pan. Switch of the stove and add coriander powder, red chilli powder and turmeric powder and mix well. This is to prevent the powders from darkening and over cooked. Add the ground mixture, mix well and close with a lid and cook till the oil separates. 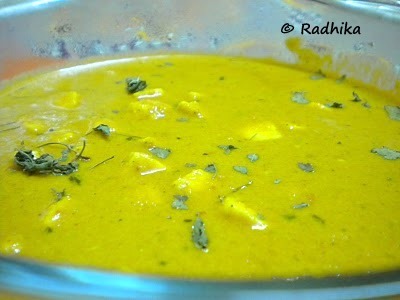 Reduce the flame and slowly add the milk, salt, paneer cubes, kasuri methi and sugar. Let it come to a boil. Add the cream just before serving, allow to boil on low and serve. the gravy looks so creamy and delicious..